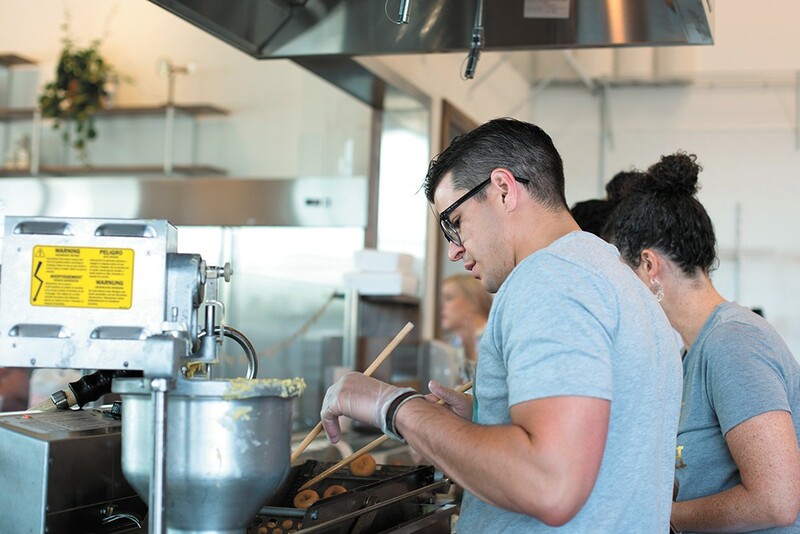 Hello Sugar, co-owner Ramsey Pruchnic works the fresh doughnut line. Whether a dusting of edible glitter, a drizzle of syrup, a spattering of mini marshmallows or a fresh slice of fruit, each doughnut at Hello Sugar, is topped with a delight to the eyes and taste buds. The newly opened doughnut shop in Kendall Yards' west end shares a space with the fourth location for Indaba Coffee Roasters, which relocated its roasting operations from its flagship cafe on Broadway Avenue. The also-new Park Lodge restaurant occupies the building's south half; all three are across the street from Olmsted Brothers Green park and just north of the Centennial Trail. Hello Sugar, (the comma at the end of the shop's name is intentional, meant to represent an affectionate salutation) is something like a love letter to Spokane from local couple Amy and Ramsey Pruchnic, who moved from Seattle back to their hometown in 2016. "We never planned on opening a doughnut shop — it wasn't a dream we had," says Amy. "But we were always looking for a unique way to serve the community." "We always wanted a business where we could interact with [the community] and see people's faces," Ramsey adds. "Doughnuts [are] the vehicle to do that." Hello Sugar,'s doughnuts are all miniature sized, at about 3 inches wide, and batches are made fresh throughout the day for each order. Flavors range from the signature "Hello Sugar," consisting of vanilla dough topped with sparkly sprinkles or glitter, to house specialties like the strawberry shortcake, topped with powdered sugar and strawberry jam and the s'more, with chocolate fudge, crushed graham crackers and mini marshmallows. Other signature toppings are tried-and-true classics like maple glaze and cinnamon and sugar. Seasonal specials rotate through the year; summer's is strawberry lemonade, featuring jam and a lemon slice. Doughnuts can be ordered by the half ($5) or full dozen ($7). The "Sugar Bucket" ($2.50) is a trio of three — sugar, cinnamon and sugar or powdered sugar — and the "Carousel" ($7.50) is a one dozen sampling of all current flavors. Gluten-free doughnuts are made fresh each morning and are available until the day's batch runs out. After being approached more than a year ago about a potential business partnership with their friends Bobby and Sheena Enslow, Indaba's owners, the Pruchnics went out and bought a doughnut maker off Craigslist. "We said yes fast," Ramsey recalls. "We decided we were going to learn to make doughnuts, so we made doughnuts in our garage and driveway for a year." "I would pick the kids up from school and bring Tupperwares of doughnuts to give to friends," Amy adds. Though they're sharing the space with Indaba, doughnuts and espresso drinks must be purchased separately. Customers can, however, order drip coffee ($2-$3) with their Hello Sugar, doughnuts, brewed from a custom blend Indaba roasts for the bakery. "We want to have great doughnuts and great coffee," Ramsey says. "We have our favorite doughnut shops, and our favorite coffee shops, but you always have to pick one or the other. We feel like we're delivering amazing doughnuts and Indaba is delivering amazing coffee. You can have both without having to get back into the car." The original print version of this article was headlined "Sugar and Sparkle"